The passenger train is composed of six wagons, one being a refreshments car. Tourists are free to move about the train during the journey to take in the best views. There are also scheduled photo stops along the route. The small town of Metlaoui is about 42 km (26 miles) south-west of Gafsa and about 40 km from Tozeur. The train departs from the Metlaoui station everyday around 10am. The full round trip is an hour and a half from Metlaoui westwards to Redeyef. 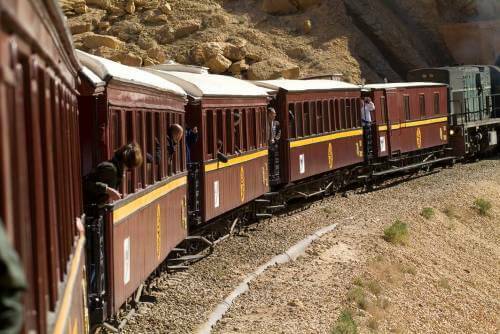 A visit to central Tunisia is not complete without a ride on the famous Red Lizard Train. It is the only way to visit the gorges of Seldja, and an amazing opportunity to view the spectacular red and pink split rock canyons of the south.